Hello everyone, welcome. One of the amazing things about roleplay games, which is often mirrored in comics, books and video games, is the incredible amount of detail that goes into creating the world. In most cases you can certainly learn to play or run a game with only one book, but there is usually a legion of Source Books lurking in the wings, waiting to ambush your hard earned cash. Frequent readers know that I am a fan of the World of Darkness Line of games, specifically products relating to Vampire: The Masquerade and Vampire: The Dark Ages. The lore for these games is incredible, surrounding the history of Vampirism, the different powers, clans and sects. However, what the uninitiated might not realise is that a significant area of the lore is also dedicated to different models of morality. The Source Book, Analects of the Third Garden delves very deeply into one of those modes. I should say that I was provided a copy of this sourcebook free for review, and I will also alert you to the fact that links to various World of Darkness and Storytellers Vault products contain affiliate tags, which means that if you purchase products on the linked website, I will receve a small commission. In a nutshell, morality has a tangible effect on Vampires. Violating your moral code causes degeneration until you eventually become nothing more than a savage, feral monster. Some vampires adopt Paths of Enlightenment that have a different definition of right and wrong, and one of these paths is the Path of the Bahari. Or, the Path of Lilith. 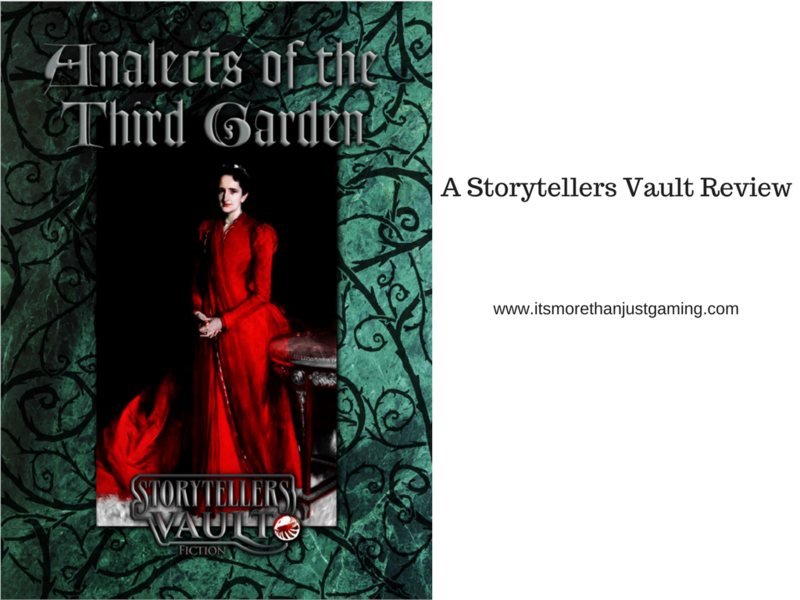 Analects of the Third Garden is an incredibly in depth look into what it means to be a follower of Lilith, as well as being an exploration of the realm known as the Abyss. I feel that I need to make a bridging statement here since I have been talking about morality. That is for the benefit of people who have never played the game. However, Paths of Enlightenment can also be considered churches, or ideological institutions that one might belong to. To be a follower of the Path of the Bahari is to be a member of a cult that promotes the teachings of Lilith. Analects of the Third Garden could be considered an academic work on the study of this cult. This Source Book is not for the faint of heart. At over 250 pages, each one filled with complex and sophisticated details it is not something you could take a glance through and be satisfied. The source book is split into five analects, covering various topics such as the history of Lilith, and the history of Caine (from the perspective of the Bahari), to how Bahari Cults are organised, what robes they wear, how they recruit and the powers that a truly powerful Lilin might command. I should say that there are previous works written for the World of Darkness game lines, namely The Book of Nod and Revelations of the Dark Mother and I have to say, I have never read these works. So, it is entirely possible I have misinterpreted things in Analects. If you are a fan of the game and a diehard Bahari or Noddist Scholar and I have made a mistake, I apologise – please feel free to correct me, politely of course knowledge shared and all that, in the comments. I suspect if you have read the two aforementioned works, Analects is a less challenging read. There is a lot of information for anyone planning to run a game that includes a Bahari Cult in it within these pages. There are Sermons that a storyteller could have their NPC Hierophant give, there are accounts that a Storyteller could copy and paste into other software to make fragments of occult books that players could find, and the level of detail about what Bahari Cultists wear and how they conduct their rituals is phenomenal. There is a running commentary in the margins from various scholars/Bahari that help provide useful context to lots of the material. There were fantastic descriptions of the Abyssal Realm. I suspect some of this information is available in Wraith: The Oblivion, however I do not own that particular game, so it was news to me. The information on how Bahari recruit members to their cult could form the basis of a chronicle start, or simply a story when one of the player’s mortal allies finds their life falling apart due to Bahari interference. There are lots of brilliant descriptions of Denizens of the Abyss, what they are capable of and how one might deal with them. As I noted this is a very hefty tome, that is not to be considered light reading. There are lots of descriptions of denizens and powers/rituals used by cultists and denizens, but no mechanics supplied (You can find those mechanics, at least for some of the rituals and creatures in Vampire: The Dark Ages 20th Anniversary Edition, and to a lesser extent Tome of Secrets). Having recently read Cainite Heresy and Ashen Cults I felt I had read the section on how the Bahari recruit before. I suspect this is as much to do with the fact that cult recruitment tend to use similar methods, regardless who the figurehead of the cult is. For someone looking for a lot of lore, particularly about the Bahari and Lilith herself, Analects of the Third Garden is a good investment. Given the volume of lore available within its pages, there is plenty to be going on with even if your players are not Bahari. If there is an Occult Scholarship angle to your game, then entire passages and pages from this work will serve well as clues and artifacts that your players might need to study to perform a ritual or a ceremony or whatever. A good, solid, work that has had a lot of effort put into it.